The entire reason anglers use fish finders is to obtain more information about the water in which they are fishing. A high-quality fish finder will provide information about the bottom, the major lake structures, cover and fish locations, which will all help you find and catch the fish. And for those anglers who are interested in a unit that includes most of the major features available in consumer-level fish finders, the Humminbird HELIX 7 CHIRP SI GPS G2 provides almost everything they’d want. Equipped with down- and side-imaging scanning sonars, GPS and chart-plotting capabilities and CHIRP technology, the HELIX 7 CHIRP SI GPS G2 is one of the most feature-packed fish finders on the market, and it will surely help you to find and catch more fish. Because of its impressive slate of features, the HELIX 7 CHIRP SI GPS G2 earns an A rating from Fishing Tech, while the entire Humminbird HELIX 7 Series earns a B+. GPS technology helps turn any fish finder into a multi-function tool that will not only help you catch fish, but navigate around the water as well. The GPS module in the HELIX 7 CHIRP SI GPS G2 allows you to mark productive fishing spots with the waypoint function, and you can also use it in conjunction with nautical maps, thanks to its chart-plotting functionality. Additionally, the GPS module records and displays your traveling speed on the display, so you can keep your eyes on the fish finder, rather than having to look over at your dashboard. Scanning sonars provide exquisite detail of hard-surfaced objects, including the lake bottom, rock piles, sunken ships, flooded timber and laydowns. This means that you won’t have to guess at the type of cover beneath your boat, or try to guess at where the fish are holding in relation to it. Instead, you’ll be able to visualize minute details of these features, and even target a given branch on a sunken tree. And while down-imaging scanning sonar capabilities are somewhat common among mid-level fish finders, the HELIX 7 CHIRP SI GPS G2 also features side-scanning capabilities. This way, you can quickly and efficiently scan the area to either side of your boat, as well as directly beneath it. SwitchFire Sonar is Humminbird’s trademarked system that allows you to customize the data displayed on the screen. You can use either of two modes – Clear and Max – when doing so. The Clear Mode removes most of the clutter that occurs on the screen when traveling through choppy or sediment-filled water, while the Max Mode provides great detail, allowing you to get the most helpful view of the water below. See the full product specs. Like most other Humminbird product lines, the HELIX 7 Series provides a number of different options (eight in total), thereby allowing anglers to select a fish finder than meets their needs, without forcing them to pay for things that they don’t want. The HELIX 7 CHIRP SI GPS G2 is one of the most feature-packed models in the HELIX 7 series, and it offers more capabilities to anglers than all but one other option in the product line do. The biggest differences between the CHIRP SI GPS G2 and the most similar models in the series are side-imaging capabilities (which the CHIRP DI GPS G2N does not provide) and networking abilities, which are present in the CHIRP SI GPS G2N and CHIRP DI GPS G2N, but not the CHIRP SI GPS G2. HELIX 7 Series fish finders give anglers the opportunity to view two different types of data side-by-side at the same time. For example, you may want to view the down-imaging sonar at the same time you are viewing the GPS waypoint map. Additionally, you can zoom in on either half of the screen independently while doing so, giving you fantastic access to the data collected. Many fish finders have complicated and counter-intuitive user interfaces, which can leave anglers confused and frustrated. But, the HELIX 7 CHIRP SI GPS G2 (and all other models in the HELIX 7 Series) relies on Humminbird’s own X-Press Menu System, which makes it easy to navigate through the various screens and find what you need quickly. Humminbird regularly updates the software used in their HELIX series products, and they make it easy to download and install these updates, so that you can ensure your fish finder continues to work as well as it can. The HELIX 7 CHIRP SI GPS G2 features Instant Image Update, which displays data on the screen in real time. This means that you don’t have to worry that the fish you see on the screen may have already swam off – whatever you see on the screen is currently in the path of the sonar beam. The Humminbird HELIX 7 Series displays are large and easy to see from nearly any position on the boat. Many anglers who tried out the HELIX 7 CHIRP SI GPS G2 praised the image quality and loved the LED backlight, which made the screen easy to see in dim or brightly lit conditions. The HELIX 7 CHIRP SI GPS G2 is clearly a high-end fish finder that will please most anglers who try it, but it is still important to compare it against other products made by Humminbird, as well as other manufacturers, to ensure you get the most bang for your buck. 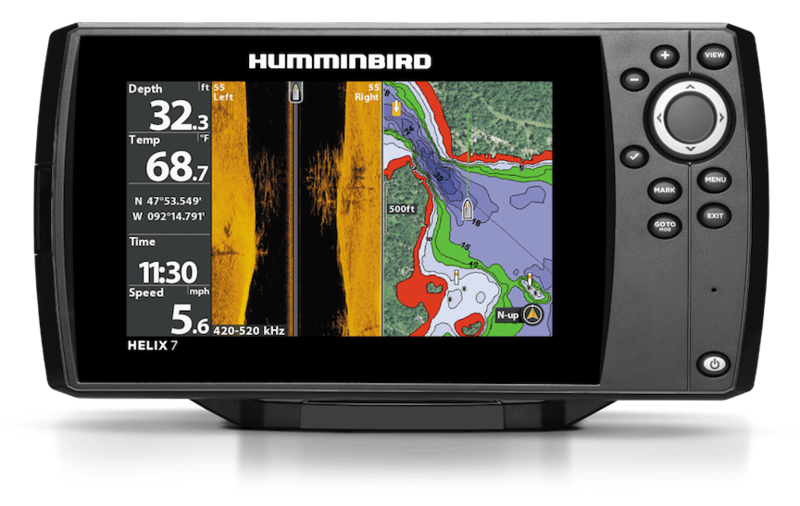 There is only one model in the Humminbird HELIX 7 Series that provides more features than the HELIX 7 CHIRP SI GPS G2 – the HELIX 7 CHIRP SI GPS G2N. The G2N provides all of the features the G2 does, and it also provides networking capabilities, which allow you to share your data with other G2N fish finders. You’ll pay about $100 more for this capability, so think carefully before deciding between the two units. While networking capability is a nice addition, it probably won’t get a ton of use by the average angler. If you do not require side-imaging scanning sonar capabilities, you can opt for the HELIX 7 CHIRP DI GPS G2N. This model will save you about $100 relative to the HELIX 7 CHIRP SI GPS G2, and yet it will also provide networking capabilities. If you don’t want the networking capabilities, you can save another $100 ($200 in total), by opting for the HELIX 7 CHIRP DI GPS G2. There are a few different fish finders that are roughly comparable to the HELIX 7 CHIRP SI GPS G2 in terms of price and features. Two of the best comparisons include the SIMRAD GO7 XSE Chartplotter / Multifunction Display and the Raymarine Axiom 7 CHIRP DownVision Fishfinder/Chartplotter. However, there are important differences that bear consideration. The Raymarine model is a bit cheaper than the HELIX 7 CHIRP SI GPS G2, while the SIMRAD fish finder is a bit more expensive, but this is a relatively minor difference for this price point. While all three units provide GPS capabilities and chart-plotting functionality, neither the Raymarine unit nor the SIMRAD model feature side-imaging technology. However, the SIMRAD fish finder is WIFI ready and a superior display image, while the Raymarine’s sealed screen is guaranteed not to fog up in any weather conditions. When trying to choose between these three models, it is important to determine how important side-scanning capabilities are for you. If you are convinced that you want a unit that is capable of imaging things beside your boat, you’ll need to go with the HELIX fish finder. However, if networking capabilities and the best display quality possible are more important, you may want to consider going with the SIMRAD fish finder instead. The Humminbird HELIX 7 Series is well-conceived and stacked from top to bottom with impressive fish finders, especially those at the higher price points. In total, the series earns a B+ grade from Fishing Tech. As one of the most feature-packed models in the lineup, the Humminbird HELIX 7 CHIRP SI GPS G2 scores even better, and earns an A rating. It has almost all of the features available in the product line except for networking capabilities, and it provides anglers with an effective way to learn about the water and find more fish.